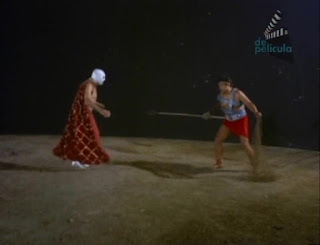 During the summer of 2015, I decided to review nothing by movies featuring the most famous masked luchador of all time, El Santo (with a slight detour to visit the second most famous, Blue Demon). 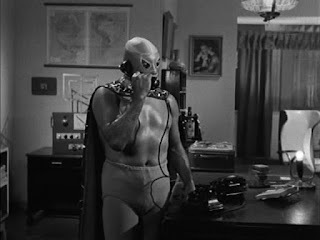 Now that the ring has been dissembled, and the capes sent to the dry cleaners, I can look back on several weeks of watching Santo. In the past I had been a casual viewer, catching the occasional Santo film, mostly to see how strange it would be. There is a preconceived notion that luchador films are all super bizarre genre mash-ups that throw everything they can think of on the screen. I'm happy to report this absolutely true, they just don't do it all at once... usually. "Look pal, I don't even know what koon-ut-kal-if-fee is!" The early Santo films chose a natural enough set-up, portraying Santo as a mysterious superhero who would help out when called upon by the authorities. It's a good fit, even though the how and why a wrestler would have super science gadgets is never addressed or even considered for a moment. Eventually, Santo moves away from having a secret lair and becomes more of a freelance hero. Sure, he helps out when asked to, but just as often he's found hanging around reading the newspaper or going on a date. Things you might see Bruce Wayne engaging in, but never Batman. One of the things that makes Santo interesting, is that he's always Santo, no matter how mundane or extraordinary his tasks and surroundings are, he has no secret identity. Yet, he's often faced with villains who want to unmask him. In the ring, it's how a luchador is defeated. In film, it often represents Santo at his lowest point, his power has been removed (albeit temporarily). Interestingly, it's women who pose the biggest threat in this regard. "What do you mean my shorts are comically huge? Who is this?" 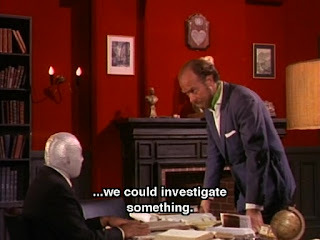 One thing I really appreciated about the Santo films, was there determination to play out their scenarios with as much seriousness as they could muster. They weren't above some comic characters or moments, but theses are just flights of fancy for a film series that is grimly determined to show you a man wrestling a werewolf. No matter how underfunded and quickly cranked out these films could be, occasionally at four or five a year, there is an underlying promise to carry out the premise of the film, no matter how ludicrous. "You know... anything, really. Doesn't matter." I never got the impression that Santo himself was giving anything but his fullest to the performance. He may not have been the best actor or the most athletic person on screen, but his drive is apparent and probably the key to his phenomenal success and status as a cultural icon. I realized that the formula for the Santo films worked when I sat down and watch one of his films this week. Summer was over, I didn't have to watch any more for this project, but I wanted to do so anyway. There are plenty of Santo films that I haven't had the chance to see, and you can bet, that it's something I will be returning to. Thanks for a great summer, Santo!